The multi-functional Large tube rotator shaker from WEIBER is designed to Incubate, Rotate, Rock, and Shake all in ONEcompact unit. This unit maintains precise temperature control and uniformity – ranging from 28°C to 75°C. Magnetic stainless steel platform may be easily set to rock or rotate almost any container. Containers can be easily mounted on the magnetic platform with magnetic clips orstrips. This unit is also ideal for Hybridization. Chamber air is gently and continuously re-circulatedensuring temperature consistency and uniformity. A variety of accessories are available to providemaximum application versatility. Magnetic Rotating/Rocking Platform & Clip Plate System holds almost any container at any angle. RS232 Port for computer control &/or data logging. Chamber air is gently & continuously recirculated ensuring temperature consistency and uniformity. Economical, Space Saving and Secure. 6 Clip Plates For 12 Each 10-13mm Tubes: Pack of 6 metal clip plates to accommodate up to 12 tubes with a diameter of 10-13mm. A maximum of 8 clip plates, 4 per side, may be attached to the Magnetic Platform. 6 Clip Plates For 6 Each 15-17mm Tubes: Pack of 6 metal clip plates to accommodate up to 6 tubes with a diameter of 15-17mm. A maximum of 8 clip plates, 4 per side, may be attached to the Magnetic Platform. 6 Clip Plates For 3 Each 28-30mm Tubes: Pack of 6 metal clip plates to accommodate up to 3 tubes with a diameter of 28-30mm. A maximum of 8 clip plates, 4 per side, may be attached to the Magnetic Platform. Clip Plate 10-13mm Tubes: One metal clip plate to accommodate up to 12 tubes with a diameter of 10-13mm. A maximum of 8 clip plates, 4 per side, may be attached to the Magnetic Platform. Clip Plate 15-17mm Tubes: One metal clip plate to accommodate up to 6 tubes with a diameter of 15-17mm. A maximum of 8 clip plates, 4 per side, may be attached to the Magnetic Platform. Magnetic Stainless Steel Bag Strip (pack of 16): Tube Holder holds six 50mL tubes vertically. Holder snaps on to any Vortex-Genie 2 mixer. No additional attachment necessary. 2 Clip Plates For Hybridization Tubes: Pack of 2 metal clip plates to accommodate one 35mm ID Hybridization Tube up to 300mm in length. Stackable Wire Rack: Stackable Wire Rack may be used in the Enviro-Genie and the Incubator Genie to increase shelf space for use as a temperature controlled chamber. Two wire racks will fit inside the chamber to provide 3 levels for containers. Serial Cable: Serial Cable may be used to connect the shaker to a computer via a serial port for data capture or programming. It is a standard 9-pin, female to female straight through serial cable. Universal Clip Plates: Pack of 2 clip plates with two elastic bands each for use with odd-shapped sample vessels. 1 Magnetic Covered 100 Microtube Box: Plastic box with hinged lid holds up to (100) 1.5ml or 2.0ml microtubes. A maximum of 4 boxes, 2 per side, can be attached to the Magnetic Platform. 1 Clip Plate For 100ml Volumetric Flasks: Metal clip plate to accommodate up to 4 100-ml Volumetric Flasks. 3-D Orbital Shaker Attachment: The 3-D Orbital Shaker Attachment provides gentle yet thorough mixing of dishes, flasks, beakers & open containers. It moves at a 5 degree angle through a 360 degree rotation (providing a combination of vertical and horizontal motions). 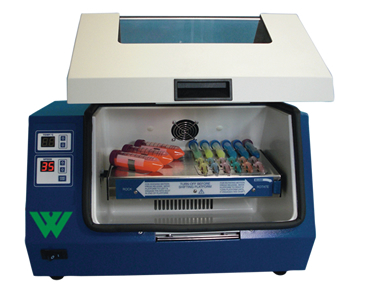 This means that every corner or crevice of a container will receive complete mixing, making it the perfect choice for applications such as gel and blot staining/blocking, sample washing, polymer resin preparation, and more. Please note, platform capacity is 1 Kg.